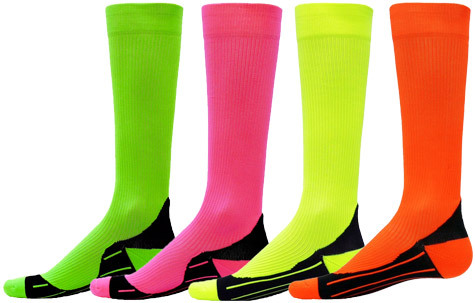 NEON GLIDE COMPRESSION SOCK ... Really Stand out and Improve your Performance with these Neon Colored Knee High Compression Socks, available in 4 Exciting Colors. These Red Lion Brand Sport Compression Socks feature a Padded Sewn-in Heel construction with a Cushioned Sole and Padded Toe for comfort and durability. Neon Glide Performance Compression Socks also Provide Ergonomic / Graduated Compression, Anatomically Shaped Left / Right Foot, Ankle Support, and they Aid in Recovery time and Reduce Muscle Vibration by using Power Compression Fabrics which Supports Calf Muscles. Our Compression Socks provide the perfect level of compression to energize your legs and enhance your performance before, during, and after your sports & fitness activities. Bright Neon Knee High Compression Sock Material: 87% Nylon & 13% Spandex. Note: Due to the nature of compression socks, they may feel particularly tight on first wearing. These socks are meant to fit snug to provide support with Medium Compression Rating. Care Instructions: Machine Wash Cold on Gentle Cycle, and Tumble Dry Low. � Neon Lime Green, � Neon Hot Pink, � Neon Yellow, � Neon Orange. 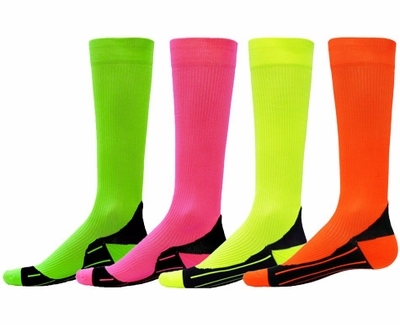 These High Tech Sport Neon Compression Socks provide improved endurance, muscle stability, lower-leg recovery, and help reduce fatigue, and most importantly can be worn while playing many Sports: Volleyball, Soccer, Basketball, Softball, Cheer, Dance, Lacrosse, Baseball, Football, Running, etc... so make sure to buy enough for the whole team. NOTE: We've done our best to show the true color of these Neon Compression Socks, however since all monitor resolutions and brightness settings are different, these bright neon colors may look different on your computer screen. PLEASE call us if you have any questions about color-matching to uniforms, etc. Thank You. ProsThe color is an eye catcher. Good comfort with the compression in the foot area.